Before opening The Barber Shop Lewes, Chloé managed the very successful Dorking branch of The Barber Shop. 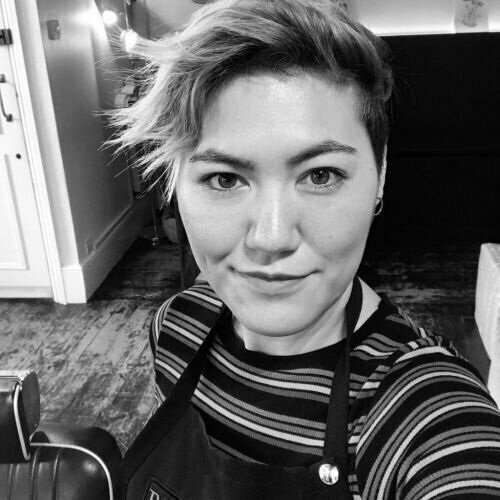 Having worked in the hairdressing profession for over 10 years, Chloé particularly enjoys the creative nature of mens hairdressing. Jess has been cutting hair for 10 years; both salon and barber trained so can take care of almost anyone’s hair needs. Considers herself to be very creative, dabbles in t-shirt design and hand poked tattoos in the evenings. Loves to travel, see live music and has absolutely no trouble making conversation! Hair is a canvas to be creative and celebrate each guest as an individual. With a total of 30 years experience in the industry which includes teaching apprentices, colouring, cutting, blow drying, and men’s hair. Thursdays and Fridays are my days to help make my guests look and feel fabulous. Reformery welcomes Lee, a barber who will be working full time in the Alfriston shop, offering a wide range of barbering services, something for everyone. Whether it’s a reinvigorating hot-towel shave, or a haircut for any occasion, Lee’s eye for detail and barbering will leave a lasting impression.